Ras Al Khaimah Investment Authority (Rakia) has enjoyed tremendous growth over the last six years. In 2009 Rakia was home to fewer than 2,500 companies; today, more than 7,000 companies call it home. Tenants, large and small, are creating a dynamic, innovative environment in which to come and do business. “While we are still finalising our numbers from 2014, I can tell you that it was a record year for us in terms of several financial and investment metrics, said Rino Sabatino, CEO of Rakia. Asian Fibres, which is based in the UAE, plans to invest $100 million in an 860,000 sq ft production facility that is expected to be fully operational by May 2015. “One of India’s fastest growing building solutions companies also joined us. 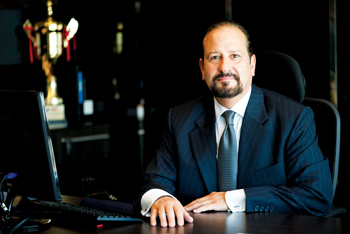 Everest Industries will occupy 750,000 sq ft at Rakia’s Al Ghail Industrial Park,” said Sabatino. Of the 7,000 companies licensed by Rakia, more than 500 are involved in manufacturing. Its other tenants hail from a variety of sectors including food processing, plastics, chemicals, building materials, metals, glass and automotive. 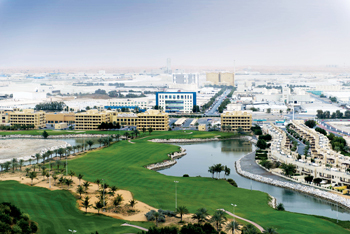 “Manufacturing contributes to more than 25 per cent of Ras Al Khaimah’s GDP,” Sabatino revealed. “Historically Rakia’s strength has been in attracting bedrocks of industry to Ras Al Khaimah. Ashok Leyland, the fourth largest bus manufacturer in the world, was one of our first tenants at Al Ghail industrial park. Saverglass, a world-class manufacturer of glass from France, is among the many investors that house their operations at Al Hamra industrial park. “To attract additional powerhouses in industry, we ensure that potential investors understand the value of doing business at Rakia, such as our competitive cost position and lease rates, free zone and non-free zone options, and tenant-centred approach to managing our industrial parks,” he added. In addition to Ashok Leyland, Rakia is also home to Mabani Steel, a major supplier of structural steel buildings based in Saudi Arabia; Mahindra Emirates Vehicle Armouring, a leading producer of armoured vehicles; and RAK Ceramics, the world’s largest manufacturer of ceramics. Other leaders in their sectors include Guardian Industries, a US-headquartered manufacturer that employs more than 18,000 people around the world; Dabur, the world’s largest manufacturer of Ayurvedic medicine and natural health care products and one of India’s leading consumer brands; Posco, a major steel manufacturer from South Korea; and Franke, a Swiss industrial manufacturer of domestic and professional kitchen appliances. These are only a few of the major manufacturers operating at Rakia’s industrial parks. 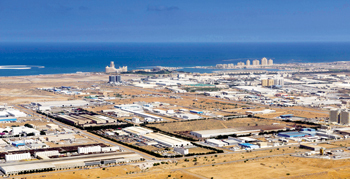 Rakia’s two industrial parks – Al Hamra and Al Ghail – totally cover 30 million sq m of land, Al Hamra having 7 million sq m and Al Ghail 23 million sq m. Of that, Al Hamra Industrial Park is now 96 per cent leased, and Al Ghail 30 per cent. Both parks feature low set-up costs as well as 100 per cent tax exemptions and 100 per cent foreign ownership in the free zone jurisdiction. In addition, its industrial zones offer customised setup solutions and access to the UAE’s world-class infrastructure. At 23 million sq m, Al Ghail also delivers room for enormous future growth. “We are committed to ensuring that our facilities remain as competitive as possible. To support that during the past decade, we have invested approximately Dh1 billion ($270 million) to develop our industrial parks,” Sabatino said. Rakia was established by HH Sheikh Saqr Bin Mohammed Al Qasimi through an Emiri decree in 2005 to accelerate economic development and attract foreign direct investment to Ras Al Khaimah. Al Hamra opened in 2005 and Al Ghail in 2008. “What’s more, as Rakia’s business has grown, the positive economic impact on Ras Al Khaimah has been significant. New retail facilities, residential developments and road infrastructure projects have blossomed to place the emirate among the most attractive places to live for families in the region. Today, Ras Al Khaimah is able to offer executives and their staff an attractive, cost-effective and commercially advantageous place to establish a regional business,” said Sabatino. “I believe in speaking in absolutes, and Rakia is unique in that it has 10 years of excellence in its industry, the most competitive lease rates in the wider region, and is one of only two government-backed authorities in the UAE to offer both free zone and non-free zone options. As in other free zones, companies that have chosen Rakia as their business zone of choice receive 100 per cent tax exemptions, full foreign ownership, and total repatriation of capital and profits. “At Rakia we also recognise the value of time. We offer a complete range of business setup solutions that allow our investors to focus on operations and their business objectives. Earlier this year, we brought the Environment Protection and Development Authority to Rakia’s corporate offices, a strategy that has expedited business licensing and made it easier for our tenants to comply with the rules of law in Ras Al Khaimah. In fact, it is so easy for our investors to navigate the system at Rakia that setup licensing can be completed in a matter of a few days. Every year Rakia attracts billions of dirhams of FDI to Ras Al Khaimah by offering companies a range of solutions that allow their businesses to thrive –both regionally and beyond. This value proposition has also won Rakia global recognition. Last year Rakia was named “Best Free Trade Zone GCC” by International Finance Magazine and “Best Free Zone Middle East” by London-based Global Banking and Finance Review. “Such accolades – particularly by UK-based publications – reinforce the fact that Rakia’s unique business offers investors a competitive edge in a crowded market. They also underscore our contribution to the economic development of RAK,” said Sabatino. Another key development was the establishment of the Rakia Tenants’ Committee, which is an association of investors that meets with Rakia’s senior leadership on a regular basis to ensure that both Rakia and its tenants are creating and enabling opportunities for success. This two-way dialogue breeds investor confidence and allows the investment authority to remain agile as a business – responding to their needs and concerns in real time. The feedback has been overwhelmingly positive and Rakia hopes to expand its efforts in 2015. “We have planned Capex spending of Dh1 billion until 2020, primarily geared toward developing Al Ghail Industrial Park. Our goal in 2015 is to see Al Ghail on the short list of the world’s informed investors comparable to the status achieved by Rakia’s Al Hamra industrial park over the past few years. “If we expand, we will do so methodically. Our main priority now is to ensure that the interests of Rakia’s current tenants are secured. In 2015, new warehouses and office buildings will come on line, and the current networks of sewage, street lighting and roads will expand,” said Sabatino.